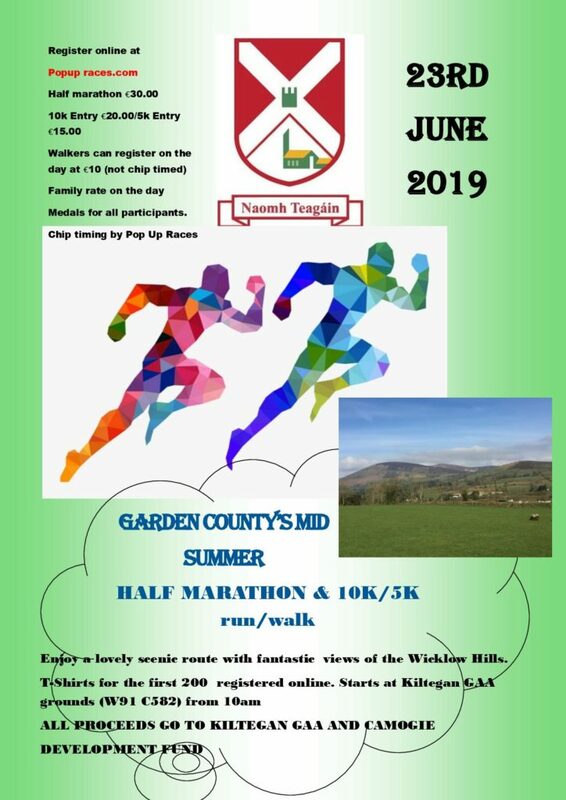 Kiltegan GAA are hosting a mid Summer Half Marathon/10k/5k run on Sunday 23rd June 2019. Runners/walkers of all abilities are welcome to what promises to be super event. Please note that there is a 5k non chip timed option available for anyone who does not wish to be timed. Proceeds will be used for a development fund for the club to improve facilities for all players from Juvenile to Adult levels. Refreshments will be provided before the prize presentation after the race in the GAA complex. If you cannot attend this event in person but wish to support the GAA club, why not enter the virtual run. A virtual run can be done anywhere and in your own time. Once you complete the run send your details to kiltegangaaandcamogie@gmail.com and they will send on your medal to you.